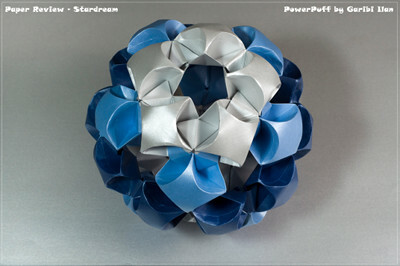 I first folded with Stardream when learning how to fold Chris Palmer's Flower Tower. It all started because of aging; my aging! 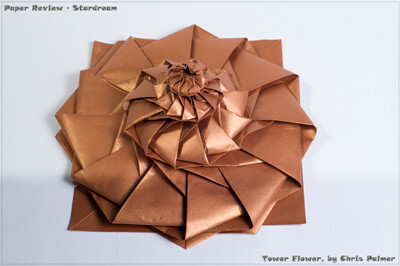 I had gone to a class to learn how to fold the Flower Tower by Chris Palmer, but forgot to bring my Elephant Hide. My teacher gave me a shiny light purple sheet of paper that I hadn't seen before, and I knew I had to review it. It is made in Italy by Gruppo Cordenons, who have two paper mills - the Cordenons mill and the Valsugana mill. The first has been producing paper since 1630 and was the official supplier to the Republic of Venice. The Valsugana mill was built in 1715, owned by influential Venetian families. Both mills were acquired and renovated by the Gilberti family in 1975. They have specialized in the production of high-quality fine papers ever since. Cordenons is FSC-certified (Forest Stewardship Council) and a charter member of UNESCO's “Trust the Forest” program. All Gruppo Cordenons' products are recyclable and more than 80% of the cellulose comes from either ISO 14001 or FSC-certified companies to guarantee it comes only from responsibly-managed forests. 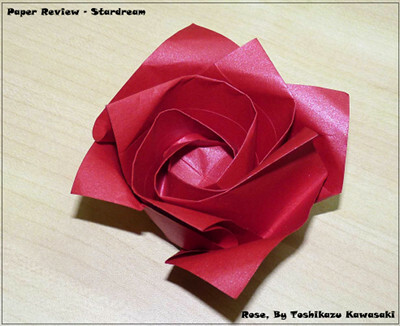 Stardream is a thick paper from the origamist's point of view. With its metallic finish and smooth surface, it's an unusual, sophisticated paper, and our sixth paper to be reviewed. Unlike many of the other papers so far, it is no celebrity paper, and far from being known as well as the others. It's definitely far from being the first choice for most folders. Is it worth trying out, or does it need some more stardust? Here is what we found. The color palette includes 33 wonderful hues. Thickness: There are four options - 110, 120, 285 and 340 gsm. Our local supplier had only the 120 and the 285 gsm but the latter is far too heavy for anything but wet folding, so we have concentrated on the 120gsm. Sizes: 72×102 cm only, which is a little larger than ordinary B1 sheets of 70×100 cm. Colors: 33 hues, many with unusual names such as Opal, Ruby, Copper, Antique Gold, Moonstone, Amethyst and many more. The color range is smaller for the 110 and 340gsm papers. Paper Coloring or Colorability: Applying water color (by Ecoline) on a small area of paper had little effect because the paper rejected the new color. A second layer of color made no more difference. I applied a lot of color to a 12×12cm sheet and it immediately curled parallel to the paper fibers. Letting it dry held down under a piece of glass was enough to correct that. The paper's original color was 'Citrin', a pearl white paper, and the result was a pale blue. Coloring the paper is possible, but difficult. Texture: The surface appears covered with metallic pearl dust. It is shiny and sparkles differently when looked at from different viewing angles. The fiber direction is easily determined by both sight and gentle bending. The surface is smooth to the touch. Aging and Wear and Tear: To quote the manufacturer, "It's acid free and archival which makes it the premier choice for Annual Reports, Presentation Folders, Brochures, Greeting Cards, Invitations...". So it's certainly intended to last. Tearing is a different issue. If a tear starts, nothing will stop it. If you try to pull out a stuck flap with just a little too much force - the paper will tear. In the laboratory tearing test the result was 770, while printer paper scored 540 and Elephant Hide 1120. Memory: Very high. Make a crease, and it will stay. The paper hardly jumps back. 9 out of 10. Forgiveness: Again, a high score - there is no problem reversing a fold. 9 out of 10. Tensile Strength: This test is now done by machine making it easier to compare to other papers. This paper can hold 10kg with and 5.7kg against the grain. A 150mm strip stretched by 4.2mm with the grain and by 12mm against it. Again those numbers are between the values obtained for Elephant Hide and Printer paper. For a heavy paper this is a bit too low. 7 out of 10. Bending Resistance: This section rates the amount of force you need to apply to get a sharp crease and how strong the paper is while being curved (like during the puffing of the PowerPuff unit). Of course, with such a heavy paper, this paper has a high score. 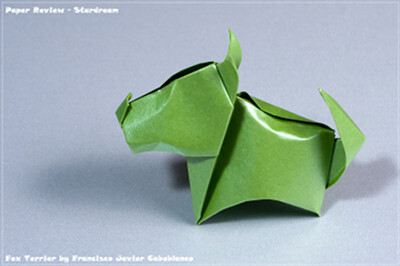 The numbers are similar to Elephant Hide, although it feels easier to fold Stardream. The score is between 9 and 10. Photogenic: The surface glare adds an unusual look to the photograph. It's really down to taste! You can get surprisingly sharp edges with such a heavy paper, and it's easy to fold. It was easier than expected to get a sharp beak and tail. I had left some space when I narrowed them, so reverse folding them brought them to the exact place. A good result. This paper works well for all three action models. The push mechanism for the dog made formidable barks. The thickness of the paper made for balanced and strong flapping for the bird. The springiness resulted in the frog making many somersaults (but only short distance jumps). 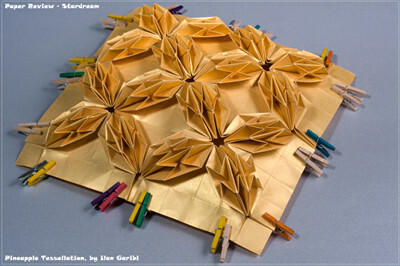 Stardream is one of the best papers to use for tessellations. Folding the grid was very easy. This paper is soft and folds easily. Reversing the grid was almost unnecessary as the creases simply bent back in the other direction. Pre-creases were also very easy to do. There was also very little effect on the surface surrounding the end of a crease, ensuring a flat surface where no creases are needed. Collapsing was also surprisingly easy. The "Snap!" effect is strong and the final result looks very clean and sharp. Even the final step, making six reverse folds in every little pineapple, was effortless. It's not the best paper for more complex models, but nice results are still achievable. 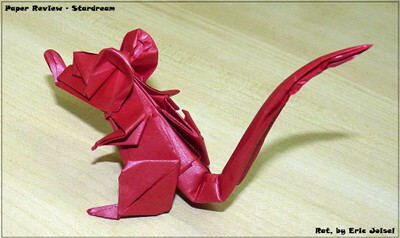 Although the paper is quite heavy, you can still create well-proportioned models. Using almost double the recommended size, I felt that this should go well. I reinforced every crease with a bone folder and went through the stages quite quickly. At step 31 a disaster happened. When trying to pull out an inner flap the paper got stuck. With just a little bit of extra force the paper tore; a long tear in the paper which was stopped by the next fold line. Step 37, sinking the belly, was painless, maybe the easiest sink I have folded from all the reviews so far. But later steps weren't so easy. Reversing the rear legs was a struggle; the many layers were hard to maneuver. Thinning the belly was even harder, and the fine details of the legs - terrible! Surprisingly, the final result is not that bulbous, but well proportioned. Definitely consider this paper for modulars! This pictures shows off three different colors, and the high surface tension. This model worked very well. The paper is heavier than Elephant Hide, but easier to handle - the first crease goes in easily and reversing it takes almost no effort at all. Despite its thickness, it folded accurately. Puffing was the best part. 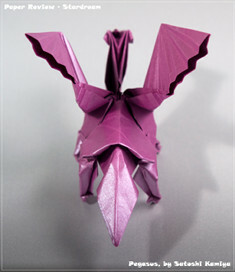 It molded exactly as it should, a benefit of the paper's high surface tension derived from its thickness. 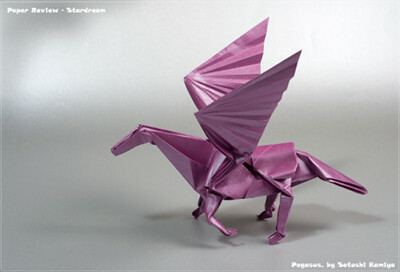 While it was difficult to fold, it's easy to enjoy the beauty of this model! The paper is far too thick for this model. Multi layered folds are almost impossible. But at least the paper didn't tear. A classic model in classic red. Using the lavish red paper, I decided to fold this classic rose. This strong paper keeps its final pose beautifully. Sharp creases will last and soft creases can be corrected or shaped surprisingly easily. The paper is easy to mold, both with and without wet folding. This one page, eight step model is flat until the last step. Folding through the first seven steps was a piece of cake with no shortcomings from the thickness. Going 3D at the last step was perfect with and without wet folding. The head was finalized just by dry folding, but the legs and back needed some touches of water to make them stay. Drying was very fast as just a little water is needed. The legs do tend to splay a little, but not too much. Carefully dampening the paper is necessary, but can lead to wonderful results. A new model in our review and sure to be a classic wet folding model. 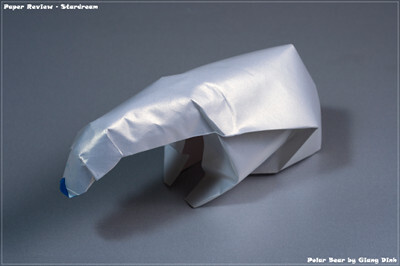 If you are careful with the moisture level and the paper becomes just soft, it is easily shaped. Apply a little too much moisture (and I do mean a little) and you lose the smooth surface. After drying, the shape holds firmly. 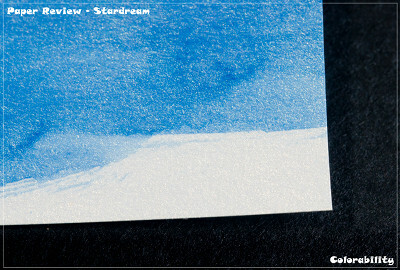 I was pleasantly surprised by Stardream. It's a hidden star indeed. Easy pre-creasing and the ‘pop' into place make it ideal for tessellations. Modulars benefit from the high surface tension, although the smoothness may be a disadvantage when connecting units by friction. 3D models and traditional flat models both had very satisfactory final results but required quite a lot of strength from the folder. Wet folding was slightly tricky, but we tested a light weight paper for wet folding, so apply moisture only as required. Complex models are too much for this paper but good results can be obtained when attempting intermediate to high-intermediate models. 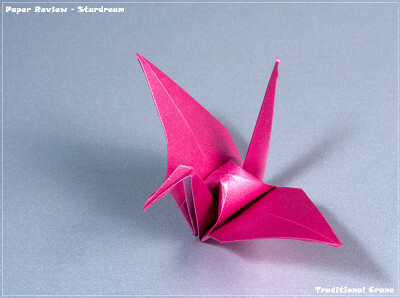 Searching flickr, I found 184 images mentioning Stardream. Only 14 folders are using (or at least declare using) this paper. I counted 27 tessellations and around 20 variations of Chris Palmer's Flower Tower. The rest are mostly boxes, vases and geometrical shapes. Only 5 modular models, one complex model, and 12 intermediate animals. We feel this paper has a lot of potential, and deserves to be investigated by more folders. Bottom line: A rising star! the paper is so pretty. how can i get the paper? Read the last part of article. She cite the places where you can actually buy this amazing high quality paper. By a stunning coincidence, I recently started selling squares of this paper on etsy. Right now I only have 4 and 6 inch squares, but I can make larger sizes available, if there is interest. For the time being at least, I only have five colors. If there is demand, I may acquire others. I've been enjoying this paper a lot, as at least 17 of the models tagged on flickr are mine. I just recently found this paper in a local art shop, so I had to buy a few sheets to test. Today I went back and bought 30 more sheets because it is so wonderful! I only managed to find 24 colors, and only in 8 1/2in by 11in size, but that is fine. Oh, you might need to call it "double-sided metallic paper" when you ask though, or else the shop might not know what you're talking about.